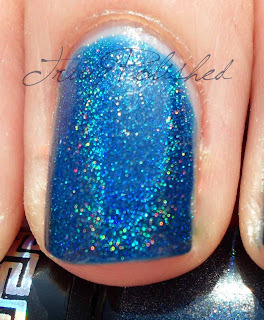 Today I have one of the polishes I got in my package from Llarowe a few days ago, Apolo from the HITS No Olimpo collection. This collection could potentially be my favourite nail polish collection of all time, I love holos and these holos are amazing! Apolo is a dark blue polish with a really strong linear holographic effect. The formula on this was really good. In my opinion, base coat is everything with holos. 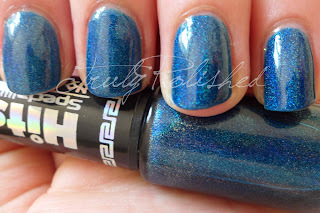 When I reviewed Poseidon I had on a normal glossy base coat and experienced some dragging with the first coat so I wanted to try a different base with Apolo. I used Nubar Ridge Filler and found it so much better! With ridge filling base coats I find you get a rougher, more matte finish and holo polish goes on so much easier. I used three coats of Apolo but I could have got away with two if I'd have been more careful. 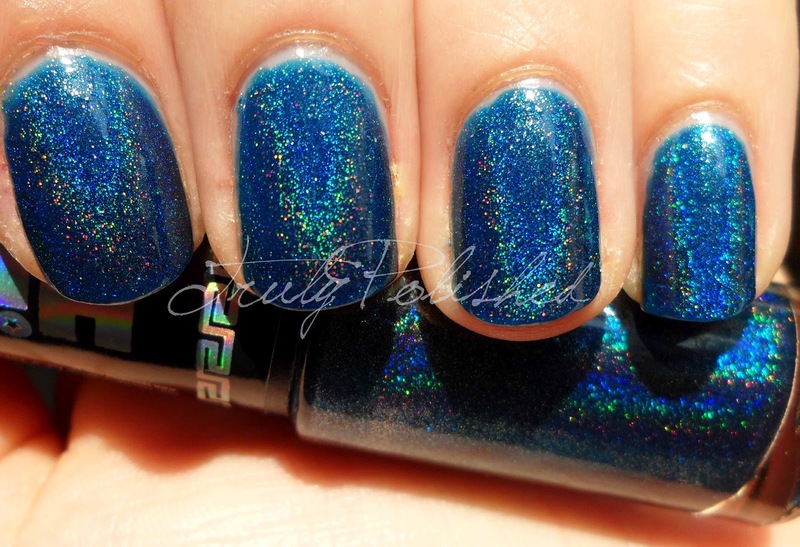 Compare that to four coats of Poseidon here! The holo effect was really strong, although not as strong as Poseidon. However, I think that's because Apolo is a darker and more pigmented polish. Either way this is beautiful and might be my favourite holo polish yet! In the sun it looks amazing and inside it is a really pretty denim blue colour which I love! The photos below show three coats of Apolo with one coat of New York Colours In a New York Minute clear top coat. It's probably worth mentioning that even with the fast-dry top coat, the dry time for this polish was horrendous! I was denting it hours after! I think you'll agree this polish is a real beauty! You can find it here at Llarowe for $10. You should definitely try some! They're my favourite polishes!